Category: Self Help & Personal Development Tags: diary, positive psychology. 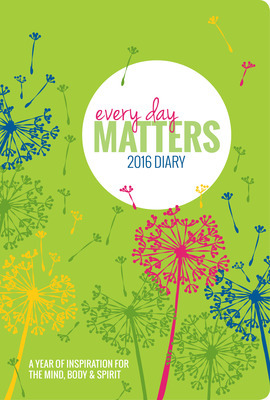 A refreshed and updated version of the former bestselling Mind, Body and Spirit Book of Days, this contemporary, illustrated diary provides not only plenty of space for daily planning, but also vibrant colour artworks that will lift your spirits and offer inspiring advice on how to make each and every day really matter. Designed as a resource for enriching daily life, it will guide you on a journey of awareness and fulfillment as you go about your weekly activities. It’s all-too-easy to become overwhelmed with multiple thoughts each day as our to-do lists grow, so positivity blogger Dani DiPirro presents insightfully, within this cheerful diary, one life-enhancing theme a month to focus on. Each week-to-view spread then features a thought-provoking quote that encourages reflection on the theme, as well as an exercise to further your holistic well-being. By focusing on one theme per month, but in varying ways each week, the diary allows a seed of positive awareness to grow over time so that positive action can become an integral part of daily life. So here’s to a year ahead where we really do make every day matter.